All Fingers Aboard Gets Those Fingers Moving! We’ve all heard the phrase “Rome wasn’t built in a day.” Well, students can’t be expected to become typing masters in a day, either! We all need time, practice, and a little guidance in order to learn how to do new things. When we turn the keyboard into an exciting world of fruit, islands, or even the cosmos, it’s easy for students to have a blast while learning! 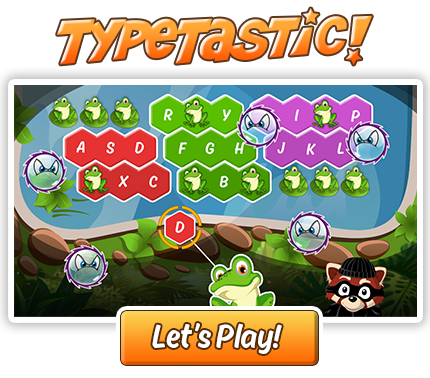 With TypeTastic’s All Fingers Aboard, kids can get to know the basics while expanding on the essential fine motor skills they need for touch typing. How many fingers will they be using this time around? That’s right, all ten! So far, we’ve seen them make incredible strides with a few fingers exploring on the keyboard. In the first three games of My Keyboard Adventure, children were able to familiarize their fingers with the keyboard. The letters were all new to them, and this helped break the ice on mapping out basic letters. They also discovered two new ways to explore, shooting bubbles and saving lost ducklings when practicing their new typing skills. Now, let’s encourage them to put both hands to the test. But first, let’s forget about letters and writing for just a moment. It’s time to focus on movement. Our games, like Balloon Pop and Fruity Keys, are designed to challenge students to learn the fundamentals of typing. Courses are centered on finger movement, with the letters appearing while kids type, mimicking the movements in actual typing to help them make the connection. By playing and completing these interactive games, they’ll be memorizing the movements they’ll need to type in school and in life. A lot is happening when children learn how to type, whether they realize it or not. Developing these fine motor skills and finger movements is the primary focus here. Kids will learn the right form and build the foundation for touch typing in the future. Right, left, all together! Lessons are often separated into either right- or left-hand exercises, which then move on to more challenging games that use both hands. The games are also designed to keep kids focused, with six levels for them to choose from. If a level is too easy, it’s time to move up! But if it’s a little too challenging, the easier one will help them build their way up. For example, a child playing Fishy Escape can use her right index finger to catch a fish in the upper row, with the letter U appearing. That way, they can connect the dots between their finger and the correlating letter. By focusing on the movements that go into typing in this chapter, students will eventually better connect the two down the road. Let’s kickstart those keyboards and master the fundamentals of typing! ← Want a Keyboarding Curriculum that Works? Here You Go! I am unable to login or to access my student login information. I thought I had gotten access to something when I signed up?